The Sapphire Foundation was established to promote the oneness of the population, including all living creatures, with the planet they live on. To Protect and Conserve our Natural Resources including Land and Energy by physically participating in the ownership and use of those resources, as well as the proliferation of Knowledge and Understanding of their impact on the world and its inhabitants. The scope includes the selection and acquisition of lands in order to preserve the properties natural character and purpose. Thereafter, the Foundation will own the lands and protect them in a manner consistent with the goals of the foundation. This land management is the main thrust of the Foundation. However, SF is also interested in the research and development of alternative fuel sources as well as the promoting of its goals through the arts and education. Sapphire Foundation is currently establishing working relationships with the communities, schools, and civic organizations in the areas of the preserve, to set forth guidelines for visits and studies of the property. SF is also developing an operational plan for the alternative fuels program that will include design and analysis of sources of non fossil fuel energy. The Sapphire Foundation is dedication to preserving land in its natural state, while also providing young people with the opportunity to study and value nature. Bassam Out-camp is the first property set aside by the Sapphire Foundation to meet its goals. In January of 2005, the Foundation set out to find a parcel of land that could be preserved in its natural state and provide an excellent environment for campers to study nature and its relationship to God and themselves. The Principia College Solar Car team has been competing on a global level with their fresh insight and uninhibited creativity. The Sapphire Foundation is proud to sponsor various parts of the electrical system of the car. The car participated in the 2006 World Solar Rally in Taiwan. It finished in 7th place on the first day. The computer controlled battery charging interface was designed and built by the team at Principia College. It out performs the systems that are commercially available. This cutting edge technology fits nicely into the Goals of our Foundation. We have always been open to the creative ideas that are laid before us. Some of those include the use of solar energy to help sustain the farming industry. 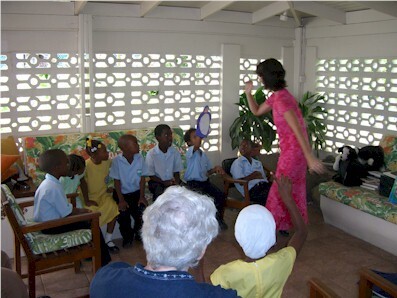 Striving to prepare their students for successful adulthood, the Meridian School of Grenada had a limited supply of educational literary material. The Sapphire Foundation coordinated with school representatives in order to donate and establish an orderly and more complete school library. The Meridian School now lives on as the Peak Institute of Grenada, continuing in their dedication to support well-rounded students and contributing members of today's society. All questions and suggestions are encouraged!